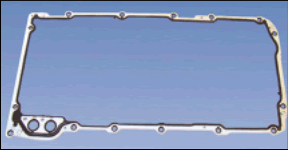 Milodon pan gaskets will not crush, split, shrink or squeeze out like inferior gaskets. You can't tear them, even if you tried! Reistant to gas, alcohol and fuel. For leak free pan installation use the right gaskets the first time. You don't need an oil leak on your new motor because of a cheap set of $6 gaskets. Additional "free" horsepower can be found by the installation of a crankshaft scraper. A scraper will remove any excess oil left on the crank & rods that the windage tray does not remove. 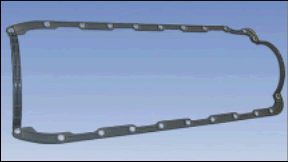 Scraper requires fitting to individual crank and rod profile, as well as to engine stroke. Wiper should be fitted to within .045" from rods and .035" from crank counterweights. When installed, scraper is sandwiched between pan rail and block. Milodon one piece pan gaskets stop leaks at the corners were conventinal individual pieces gaskets met and are reusable too. Steel inserts around each bolt hole allow the pan bolts to be securely tightened yet the gasket can never be over tightened.